I adore the Petite Purse Die for the Big Shot! The possibilities with this adorable little bag are endless; and to demonstrate, here is a shower favour I did up for my sister-in-law's baby shower this past weekend! I cut the purse out of Chocolate Chip card stock, then cut off the flap to leave it open. I then cut out a "pocket" to go on the front of the bag, which I affixed using Stampin' Dimensionals. I then use a retired set for the baby bottle and food jar which I adhered inside the pocket. Topped it all off with a bow using our 3/8" taffeta ribbon and voila, a cute little diaper bag! 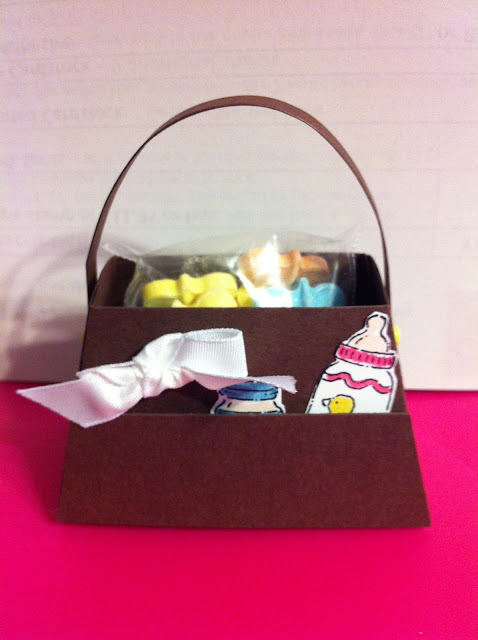 Inside the bag are pacifier shaped candies, the perfect accent to any baby shower. To learn more about the Petite Purse die or the Big Shot (or both), simply contact me for more information. 289-280-0304 or stampnsteph@gmail.com. You can shop my online store 24/7 by clicking the button at the top of my page.